Love creme caramel? 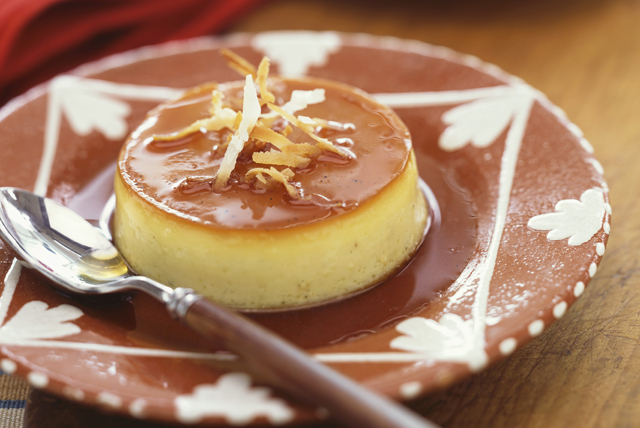 Check out our easy recipe for Creme Caramel with Toasted Coconut. The coconut adds a Mexican touch to this classic restaurant favourite. Cook pudding as directed on package. Cool 10 min. Meanwhile, bring butter, sugar and water to boil on medium-high heat. (Do not stir.) Cook 3 to 4 min. or until golden brown, occasionally swirling skillet to prevent caramel sauce from burning. Spoon into 6 (125-mL) ramekins. Immediately swirl ramekins to evenly coat bottoms with caramel sauce. Cool 5 min. Pour pudding mixture into prepared ramekins. Refrigerate 4 hours. Run knife around edges of ramekins just before serving; invert onto dessert plates. Sprinkle with coconut. Serve topped with fresh strawberries or raspberries. Stir 1/2 tsp. ground cinnamon into prepared pudding before spooning into prepared custard cups. These creamy desserts can be refrigerated up to 24 hours before serving.